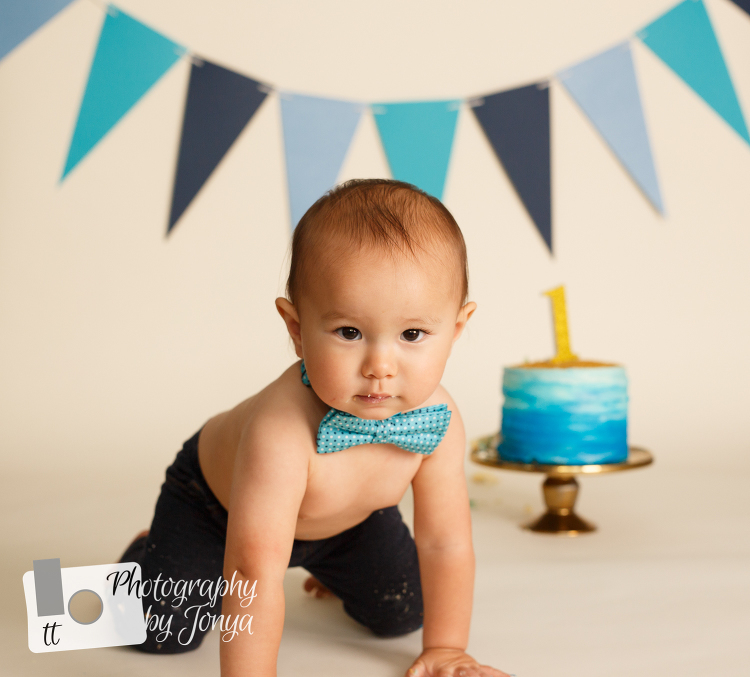 First birthday cake smash sessions are, without a doubt my absolute favorite sessions. I have photographers say to me on a regular basis, “I don’t know how you do so many cakes sessions. I really don’t like them at all. They are too stressful”. I always respond with “that is why I don’t do your type of photography.” I truly believe that we all have our talents and our favorite sessions, I find it hard to understand how this much cuteness isn’t fun for others. 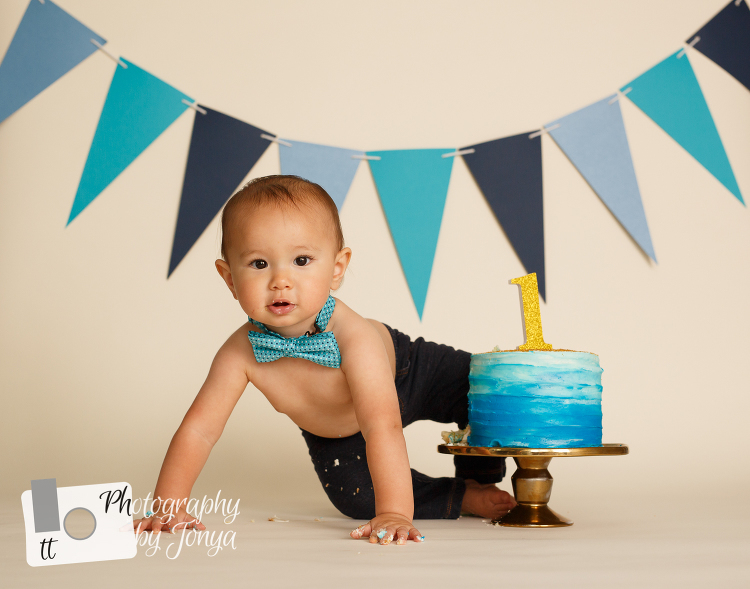 I mean, look at Maxwell’s cake smash! Look how cute he is. Just like almost all babies who start out on their cake smash session, he was slow to get into it. But once he got into it he was a natural… And he ate as much as his cheeks couldn’t hold. Isn’t that bowtie so precious on him?? He got through the whole cake smash without even getting a crumb on it. I am not sure exactly how he did it, magic, I guess… because he got cake every where else… especially his toes. Many times during the first birthday cake smash session, it is almost rite of passage to have their tiny toes covered in frosting. Once that happens, the baby becomes one with the cake and then it is smooth sailing from that point forward. 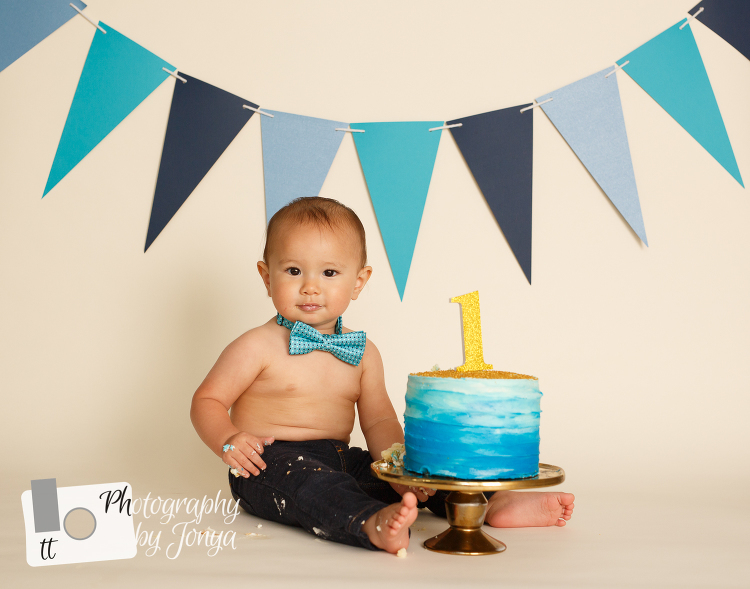 I really loved the shades of blue both on this delicious looking cake with the banner. It helped contrast the blue and marry them together. This cake was designed, baked and delivered by a local Holly Springs baker, Baked by Billie. I frequently work with this baker because she offers the delivery service and uses local farmed eggs and the finest ingredients in every item she makes. She also works hard to make sure we are all on the same page with colors to be able to have the sessions look as great as this.